The International Fashion Week 2010, aka IFW10, produced by GLANCE International Agency (GIA) was launched yesterday. 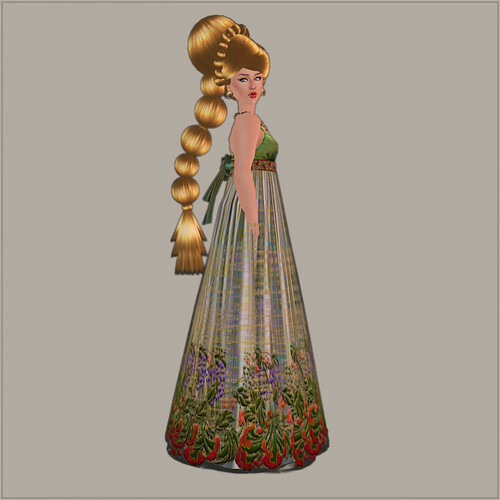 On this second post about the IFW10 event I take a closer look to AlaFolie from which I received some very pretty and very ladylike outfits. In these pictures I have also used my favorite PurpleMoon runway hair, Lea. LAURA is a lovely outfit for both formal and little less formal events. The full pack apparently includes a shorter version too, but here you can see the long one. The gown looks like something a fine lady would wear at the evening after a hot day, somewhere South. Actually I feel like it should come with a turban of some sort. The pack comes with shoes (similar as the ones seen on the next outfit), several jewelry (some shown in the pictures) and bandau, a headband. NUIT D'ETE (Summer Night) is a perfect little outfit to wear later the night, maybe for more informal festivities. The flexi dress moves a lot, so it seems great for a spin of salsa. This outfit comes with high heeled shoes as well. Check out these and many other beautiful items at IFW10 (SLurl). See also IFW10 Sneak Peak #1.